Vancouver has just hosted the 4-day 2nd International Conference on Learning Analytics & Knowledge, which sold out after doubling in size from last year. With sponsorship from the Gates Foundation, EDUCAUSE, and leading VLE vendors, this testifies to the huge interest and energy around the implications of the Big Data/Analytics/Predictive Modelling wave — for when it crashes on learning. We’re talking not only about traditional educational institutions, but also the learning revolution on the social web which sees a boom in educational start-ups specialising in weaving together social media and data analytics to provide learning that is increasingly personalised, but motivatingly collective. A post-conference invitational Summit brought together major educational professional associations, technology companies small and large, and academics to map some of the key challenges for the road ahead. I was there as Programme Co-Chair, as well as observing it through the FuturICT project lens, a very large scale project concept around the implications of Big Data/Analytics/Predictive Modelling for society. What we see unfolding is an intriguing landscape whose contours may be remoulded in the way that data science has impacted other academic fields — and businesses. Ethics. Data does not speak for itself — the whole enterprise of modelling and analysing the world computationally is inextricably linked to human interests and judgements. What to measure, what to ‘clean’, what to extract, how to render it, how to read it, how to act on it… See the excellent critique Six Provocations for Big Data for more on this, and my talks Learning Analytics: Dream or Nightmare? [short / long / debate]. Evolution or Revolution? There is a huge driver in certain countries for analytics to improve course completion rates. There is quite clearly an economic incentive for institutions, and one might have thought, for students. Some of the most impressive work which has excited a lot of interest has been in analytics which give students and tutors real-time feedback in the VLE, using predictive modelling of course completion based on online behaviour patterns and demographics. However, a debate broke out at LAK12, around whether course completion = real learning. 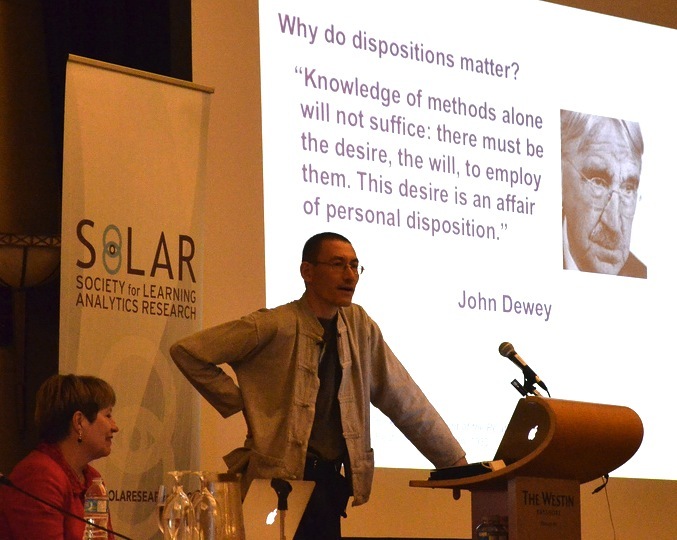 There is concern that analytics are being recruited simply to reinforce the current educational paradigm with its traditional pedagogical approaches (often very weak). There is deep concern that our educational systems are not equipping students adequately for a world of unprecedented complexity (see FuturICT project!). There was much talk of looking under lamp-posts because that’s simply where it’s easiest to see with relatively impoverished computational lenses… The alternative — or complement? Perhaps analytics in support of more radical pedagogical models, based on theories of deep learning and the transferable ‘21st century competencies’ that our children, students and workforce need [my papers on this]. Educational Data Mining = Learning Analytics? I hosted a panel debate in which we invited panellists from the longer established EDM community, to explore with panellists from LAK, the nature of the EDM-LAK relationship. This turned into an interesting debate, conducted in very polite terms (mostly! ), which seemed to confirm that EDM researchers contribute expertise in designing and improving data mining algorithms and large, fine-grained data sets (often from intelligent tutoring systems), from which some LAK researchers could certainly benefit. However, LAK is also concerned with other forms of analytic (e.g. social networks; discourse; dispositions), and has a priority to bring in the wider constituency of stakeholders who form the ecosystem around analytics, from learners and educators, to administrators to policymakers at institutional, regional and national levels. This seems to me very appropriate, since data and analytics platforms (in general) do not exist in a vacuum, but always within intellectually, economically and politically charged contexts. 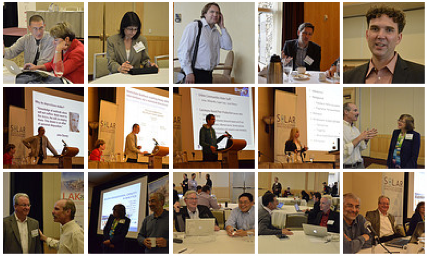 Many thanks to all who made LAK12 such an intellectually and socially stimulating experience. The replays of all sessions will go up shortly on the LAK12 website, so you can enjoy the cut and thrust for yourself — and join us next year in Leuven (just outside Brussels) for LAK13!